It is important to give family and friends the opportunity to celebrate a person’s confirmation day with them and share their own thoughts, observations, and prayers. This Confirmation Day Milestone Moment supports the important experience of celebrating confirmation day by creating faith-filled memories after the Rite of Confirmation is completed in a public worship service. Confirmation day memories can be strengthened with faith, hope, and love by gathering with family and friends in the more intimate setting of the home. 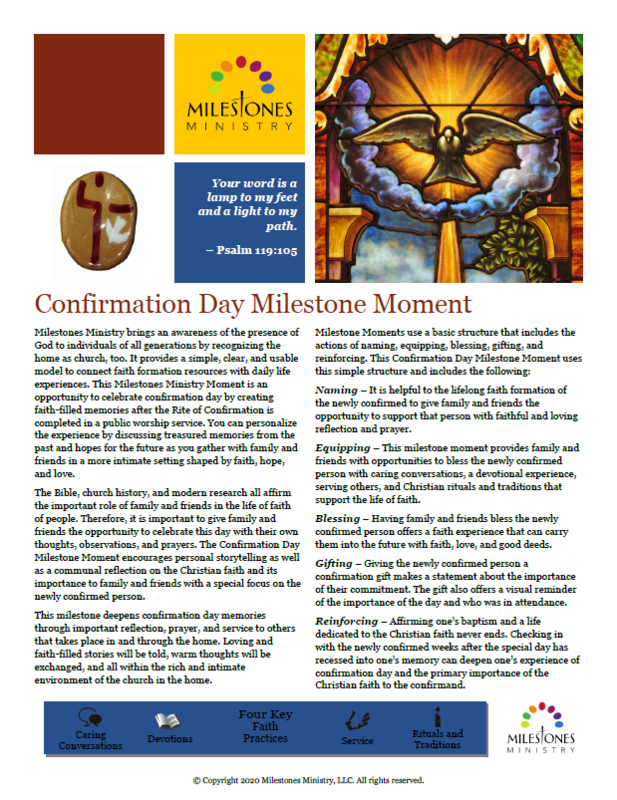 This milestone moment encourages personal storytelling as well as a communal reflection on the Christian faith and its importance to family and friends with a special focus on the newly confirmed person. These Confirmation stones are individually hand-crafted and available at a low cost to purchase and gift as meaningful reminders of this Milestone Moment. They are wonderful keepsakes to honor and celebrate this special day for the confirmed person.